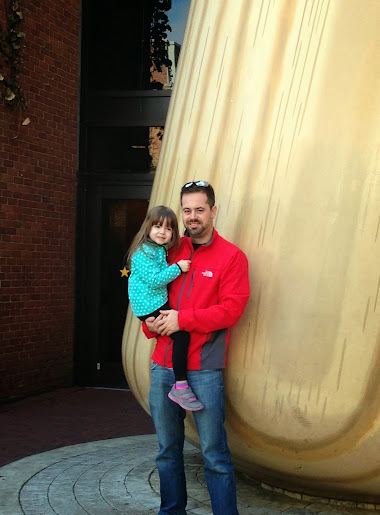 While my parents and brother were visiting over Thanksgiving and the week after, I planned a trip for us to the Louisville Slugger Museum here in town. My entire family are huge baseball fans (I love baseball, myself) but my brother Jeff, especially, lives and breathes the game. As this was his first time in Louisville, I knew it would be a fun surprise for him if we could go. The bat in front of the Louisville Slugger Museum is an exact-scale replica of the model R43, 34″ wood bat, designed to specifications requested by Babe Ruth in the early 1920s. It stands 120′ tall, making it the World’s Biggest Bat. I had never been to the Slugger Museum either and, oddly enough, even though my husband has lived here pretty much his entire life, he also had never been. I knew Bubbles might be a little young to appreciate it all, but she’s always happy to go anywhere, especially with her Uncle Jeff. We arrived around mid-morning and picked up the complimentary tickets that were waiting at the front desk. Depending on the season, tours start anywhere from every 20 minutes to an hour. When you get there you’ll be directed just down the hall to a little theater with stadium seating where you get to watch the 13-minute film “The Heart of the Game”. It’s a nice insider’s look at what all goes into hitting along with some other anecdotes. After the film you exit through a different set of doors and walk into an interactive display area. Here you’ll be able to experience just what it feels like to be on the receiving end of a 90 mph fastball, handle real bats, check out memorabilia and more. We didn’t really have enough time to experience all of it between the film and the start of the tour but fortunately you’ll be able to reenter later if you’d like to explore more. During the tour there’s no photography or video recording permitted, so I can’t share with you an visuals from that portion. But I will say it’s a very interesting experience where I learned a lot: I really never knew just how much went into making a bat! You also may get lucky and see your favorite player’s bats being made while you’re on the tour, which was the case for my family as David Ortiz had a few being made that day. At the end of the tour everyone receives a small Louisville Slugger bat to take home (complimentary as part of your admission). There’s a number of other fun things to do while you’re there. You can even take batting practice in their batting cages (which is the only thing I remember costing money outside the admission price, and I believe my brother only paid $2-3 dollars to do so). 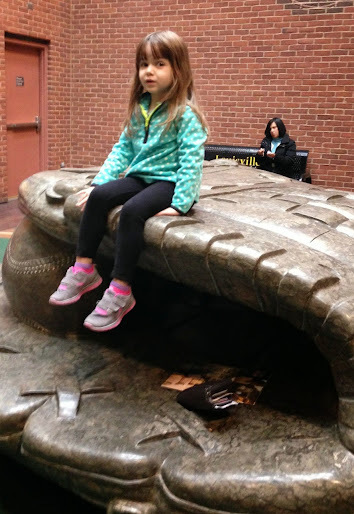 Plus there is a huge baseball glove made from 17 tons of Kentucky limestone; at 12′ long, 9′ wide and 4′ high, your kiddos will have fun crawling and climbing all over it. The Louisville Slugger Museum & Factory is open daily all year long, except for Thanksgiving Day and Christmas Day. Kids under 5 are free, and there are even group rates available. Be sure to stop into the gift shop, too; you can have your name engraved on a real Louisville Slugger! 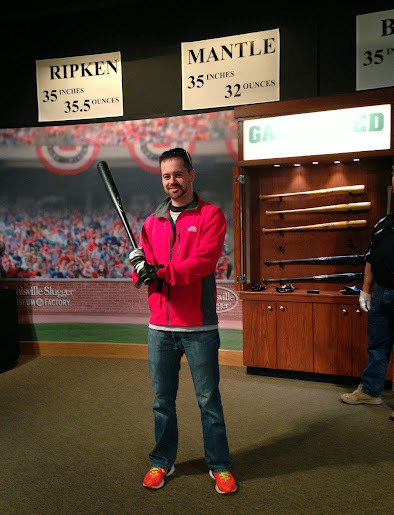 Whom would you visit the Louisville Slugger Museum with? Thank you to the Louisville Slugger Museum for providing tickets for our visit. All thoughts, opinions and experiences are my own.